Spectacular Shelburne Bay near the tip of Cape York is the final resting place of a legendary Manta Ray to some, a long running conservation battle to others and one of the world's highest grade silica deposits to a long established Wollongong fashion store. Phil Dickie and Susan Brown find a very Queensland problem that the State government has to resolve by the end of the week..
Silica mine or National Park? The State government this week faces a pivotal moment in a new battle over the startling white sands of Cape York's Shellburne Bay, as it decides whether to renew two remnant mining leases for another 14 year term. Until recently, the decision looked as though it might make itself. Three months after the renewal application was required to be lodged and with less than three months to go before the lease expired Natural Resources and Mines Minister Stephen Robertson wrote to anxious conservationists early last December with the news that no application had even been received for renewal. Three days later an application, now three months past its legal due date, for renewal of the two leases had come in from the owner of Badran’s Ladies Fashions in Woollongong. Robertson's office is now the focus of the competing interests of miners, traditional owners and Native Title claimants, conservationists, the National Parks and Wildlife Service, local graziers, and the Great Barrier Reef Marine Park Authority. His decision on the two mining leases has to be handed down by Friday. 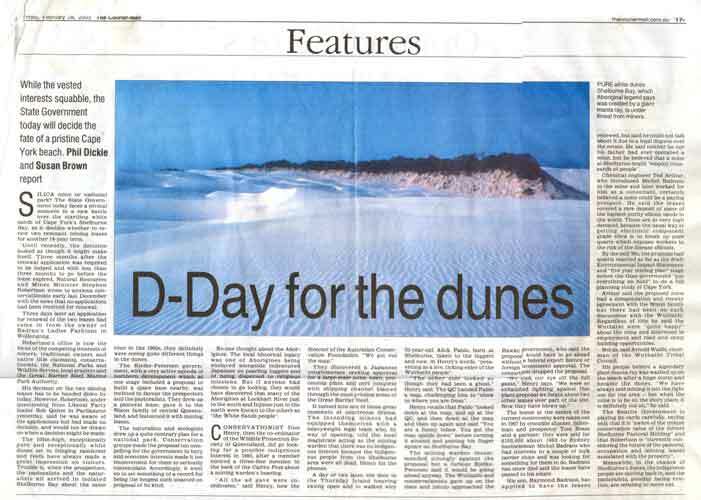 The 100 metre high, exceptionally pure and exceptionally white dunes set in fringing rainforest and reefs have always made a great impression on visitors. Trouble is, when the prospectors, the pastoralists and the naturalists all arrived in isolated Shellburne Bay about the same time in the 1960s, they were definitely seeing quite different things in the dunes. The Bjelke-Petersen government, with a very active agenda of northern development which at one stage included a nearby space base, was inclined to favour the prospectors and the pastoralists. They drew up a pastoral lease, gave it to the Nixon family of central Queensland, and festooned it with mining leases. The naturalists and ecologists drew up a quite contrary plan for a National Park. Conservation groups made the proposal too compelling for the government to bury and economic interests made it too inconvenient for them to seriously contemplate. Accordingly, it went on to set something of a record for being the longest such unacted on proposal of its kind. Nobody but nobody thought about the Aborigines. The local historical legacy was one of Aborigines being enslaved alongside indentured Japanese on pearling luggers and of being dispersed to religious missions. But if anyone had chosen to go looking, they would have discovered that many of the Aborigines at Lockhart River just to the south and Injinoo just to the north were known to the others as “the White Sands people”. Conservationist Don Henry, then the co-ordinator of the Wildlife Protection Society of Queensland, did go looking for a possible Indigenous interest in 1985, after a member noticed a three line mention in the back of the Cairns Post about a mining warden's hearing. “All the ad gave were co-ordinates”, Henry, now the Director of the Australian Conservation Foundation said. “We got out the map”. They discovered a Japanese conglomerate seeking approval for a large scale mine, town, processing plant, and port complete with shipping channel blasted through the most pristine areas of the Great Barrier Reef. It turned into one of those great moments of courtroom drama. The intending miners had equipped themselves with a heavyweight legal team who by way of opening, told the local magistrate acting as the mining warden that there was no Indigenous interest because the Indigenous people from the Shelburne area were all dead. Henry hit the phones. A day or two later, the door to the Thursday Island hearing swung open and in walked wiry 70 year old Alick Pablo, born at Shellburne, taken to the luggers and now, in Henry’s words, “presenting as a live, ticking elder of the Wuthathi people”. “The other side looked as though they had seen a ghost,” said Henry. The QC handed Pablo a map and challenging him to “show us where you are from”. Henry recalls that Pablo “looked down at the map, and up at the QC, and then down at the map and then up again and said “You are a funny fellow. You got the map upside down” before turning it around and putting his finger square on Shellburne Bay. The mining warden recommended strongly against the proposal but a furious Bjelke-Petersen said it would be going ahead anyway. The Wuthathi and conservationists gave up on the state and jointly approached the Hawke government who said the proposal would have go ahead without a Federal export licence or foreign investment approval. The consortium dropped the proposal. “We took our eye off the full game” says Henry. “We were so exhausted fighting against this giant proposal we forgot about two other leases over part of the site, now they have blown up”. The leases at the centre of the current controversy were taken out in 1967 by crocodile shooter, fisherman and prospector Tom Braes and a partner; they were sold for $100,000 in around 1983 to Sydney businessman Michel Badrans who had interests in a couple of bulk carrier ships and was looking for something for them to do, and have since passed to his estate. Chemical engineer Ted Arthur, who introduced Badrans to the mine and later worked for him as a consultant on making it a paying prospect, said the leases covered a rare deposit of some of the highest purity silicon sands in the world. These are in very high demand, because the usual way of getting electronic component grade silica is to break up pure quartz which exposes workers to the risk of the disease silicosis. North Australian Silica, which Arthur said had the support of the State Mines department, was proposing to refine the sand in Gladstone which would have got around the export licence issue. By the mid-90s, the proposal had quietly got as far as the draft Environmental Impact Statement and “five year mining plan” stage before the Goss government “put everything on hold” to do a full planning study of Cape York. Arthur said the proposed mine had a compensation and royalty agreement with the Nixon family but there had been no such discussions with the Wuthathi. Regardless of this he said the Wuthathi were “quite happy” about the mine and interested in employment and road and camp building opportunities. Not so, said Arnold Wallis, chairman of the Wuthathi Tribal Council. His people were created when a giant legendary Manta Ray was washed up on the beach after a huge storm and became the dunes. “We have always said mining is not the right use for the area – but when the mine is to be on the story place, it is definitely not on,” he said. The Wuthathi are concerned about the State government's plans for a National Park, and surprisingly perhaps, they have been joined by the conservationists in arguing that an “under-resourced” National Park would not adequately protect the area or put enough emphasis on its cultural significance..
“We can understand the Wuthathi people looking at other poorly funded parks on the Cape and not being impressed” said Lyndon Schneiders, spokesperson for the Wilderness Society. “We think there is a place for a properly funded, Indigenous managed park and here is a great opportunity for the government to get it right. But the bottom line is if the Wuthathi don't want a National Park, we won't support it. Complicating everything is the question of the Nixon family continuing in occupation of the pastoral lease which the State chose not to renew in 1999. The Shellburne lease has become a “cause” for rural lobby group Agforce, and consequently a messy welter of claim and counter-claim in the media and the Supreme Court. On court orders, the State is renegotiating the terms of the non-renewal and has an offer on the table. Eileen Nixon, who says the government is “being pushed around by the greenies and the Aborigines”, denied reports the family were demanding $1.6 million in compensation. In which case, she probably should talk to her lawyer who communicated such a claim in writing to the government. However, she also said the family had little interest in the dunes, perched lakes, swamp and rainforest area of the property which was “no damn good for cattle” and had offered to give that area back in 1999 in return for continued occupation of the grazing areas. The other parties to the various disputes over the land could not recall such an offer. The Beattie Government is playing its cards carefully, saying only that it is “aware of the unique conservation value of the former Shelburne Pastoral Holding” and that Minister Robertson is “is currently considering the future of the pastoral, occupation and mining leases associated with the property”. “It would be inappropriate to comment further on these matters while the formal decision-making process is still underway," a spokesperson said. Meanwhile in the shadow of Shelburne's dunes, the Indigenous people are moving back in, and the Nixons, possibly facing eviction, are refusing to move out. According to all, no-one engaged in purveying bridal gowns and evening frocks in Woollongong has ever been near the place. Postscript: Soon after this article was published, the Queensland government did the right thing and cancelled the mining leases.